The Clayton Chamber of Commerce teamed with River Dell Elementary STEM (Science, Technology, Engineering and Math) Teacher Cindy Raynor to raise awareness of her pilot program for elementary students. Ms Raynor has developed many curriculum based learning activities, or challenges, for the River Dell K-5 students. Some of these activities are: Pasta Bridge Constructs, Marshmallow Catapults, Egg Crash Cars, Stomp Rockets, and CD Hovercrafts. The STEM programs many hands-on lessons requires many classroom supplies. 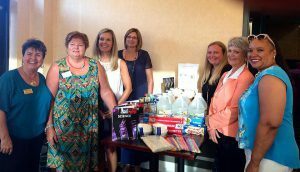 The Clayton Chamber combined a networking event for local businesses and a fundraiser for the STEM program recently. All supplies and funds raised went towards helping Raynor have a successful STEMtacular school year.